XSTAT 30 is a remarkable device that has been available for a year in the US Army; now anyone can have it. It’s approved by the Food and Drug Administration (FDA). 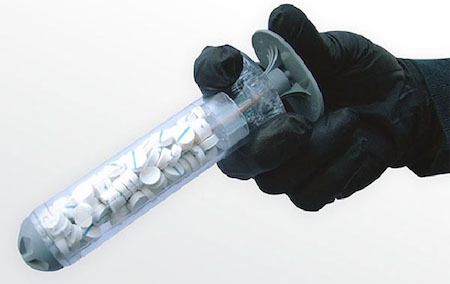 XSTAT 30 is intended for emergency usage, by victims with open wounds, usually caused by a bullet or shrapnel. An early closure of a wound and preventing an excessive blood loss can save many victims. It’s a hemostatic device for the control of severe, life-threatening bleeding from junctional wounds in the groin or axilla not amenable to tourniquet application in adults and adolescents. XSTAT, made in the form of injection, operates by injection of 92 small spongy objects that are made of pulp and wrapped with a material that has a high capacity of absorption of blood. After entering the open wound sponges, they absorb the blood and thus increase and their size. Thus achieving a closure of the wound and preventing unwanted bleeding. The process of absorption and wound closure takes about 20 seconds. Fans of Joe Haldeman might be thinking of the powered suit with trauma maintenance from his 1974 novel The Forever War. "An alien drug," the doctor said. "Used by an insect race. A warring insect race. And it's done miracles. It can patch up a smashed and broken body..."